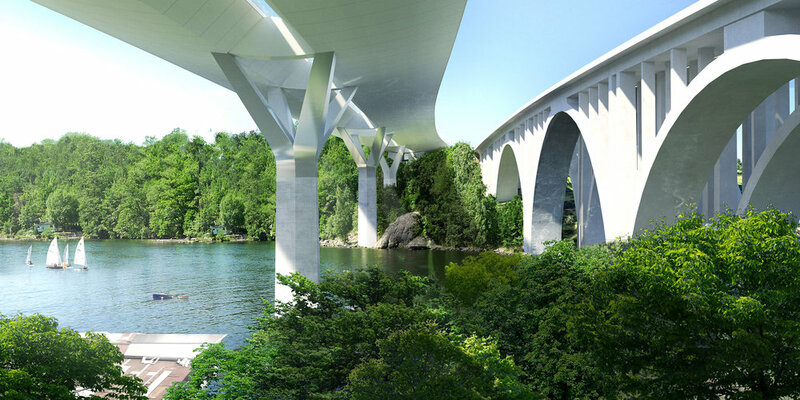 DISSING+WEITLING architecture was awarded 1st prize in a prestigious international bridge contest in Stockholm to design a new bridge across Skuru Sound. DISSING+WEITLING architecture submitted a simple yet technically advanced design proposal for the new bridge which will solve an untenable traffic situation for people commuting to Stockholm, a figure exceeding 52,000 every day. The new bridge will share the Sound with the existing Skuru Bridge which is a copy of the original arch bridge from 1914. At that time, it was the largest concrete bridge in Northern Europe. The original bridge has major cultural, historical and architectural value, and it has gained iconic status among bridge experts around the world. At the same time, this strong, almost monumental structure co-exists in glorious harmony with the steep, rocky slopes and tiny houses of the Archipelago. With this important context in mind, DISSING+WEITLING decided to develop a design with a very simple and transparent visual expression. Therefore, the architects produced a design proposal without towers, cables or viewing platforms. 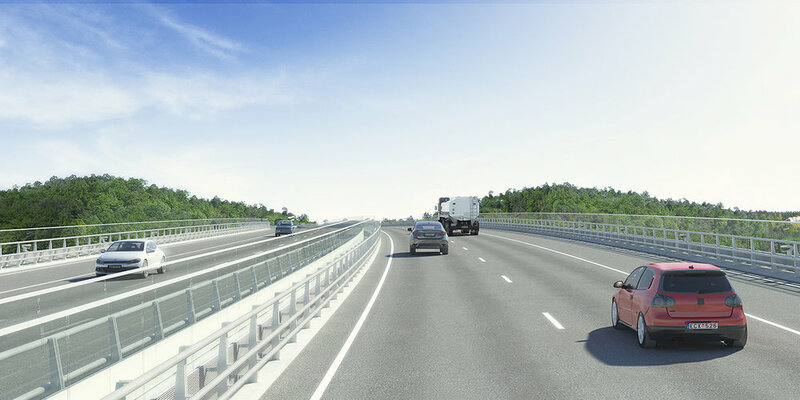 The bridge has a structural lightness with a slender, aerodynamic deck in steel, and it is made as transparent as possible by, for example, aligning the piers of the new bridge with those of the existing bridge. This creates a connection between the two structures, and the new bridge will not block the view of the old. DISSING+WEITLING architecture vandt designet for den kommende Skurubro ved Stockholm med en bro i et enkelt og transparent udtryk, skabt med respekt for den ikoniske nabobro. DISSING+WEITLING architecture’s team vandt den internationale konkurrence om en ny bro over Skurusundet. Den nye bro skal løse en uholdbar trafiksituation for de mere end 52.000 daglige pendlere til Stockholm. udvikle et enkelt og transparent visuelt udtryk. Projektet er derfor uden brotårne, kabler, skråstag eller udsigtsplatforme. Broen har en konstruktiv lethed med det slanke, aerodynamiske dæk i stål og er gjort så transparent som mulig ved blandt andet at placere bropillerne på linje med de eksisterende. På den måde relaterer den nye bro sig til den gamle uden at hindre udsigten til den.